This page will help our visitors develop a great printing resume to use while searching for a job. The information contained in the examples should be replaced with your own. It is only there so that you can see what a completed resume should look like when you are finished. Go on and place the file on your own desktop for later. Using 3 publishing printing resume formats will also help you decide on the best final one you want to use for your own once you have completed the editing. Just backspace is all you need to be able to do, then substitute. Once the editing procedure is completely finished, compare the 3 and decide on only one that has the best look and feel to it. It's so easy. 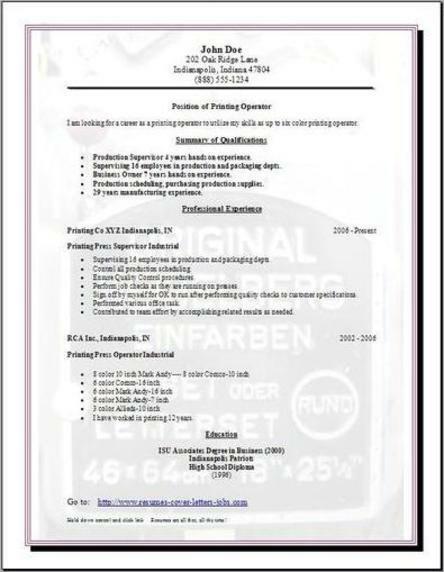 These publishing printing resume examples are very useful and fast to use. An example resume is actually one of the very less complicated forms to fill out. The format and style has been completed for you. Now you realize you can visit other examples on our website and implement those ideas also into your new resume. So experiment while making it your own. As part of a Publishing industry, the career options that you would want to look at first are divided into 6 major categories editorial, production and design, also marketing (sales or publicity), administration and distribution. Editors, will review, they also rewrite, or perform editing the writers work and might also do some original writing. There are several different types of printing editors, mentioned below. The main managing editor – is responsible for all the every day operations of the entire editorial department. Associate/Assistant editors - Who give multiple assignments to the writers and also reporters, and do perform all the editing for the final text. Copy editors - They will review each individual reporters' copy and check for accuracy. The in house Design Department will determine the overall artistry look, font and photos to use for the publication. 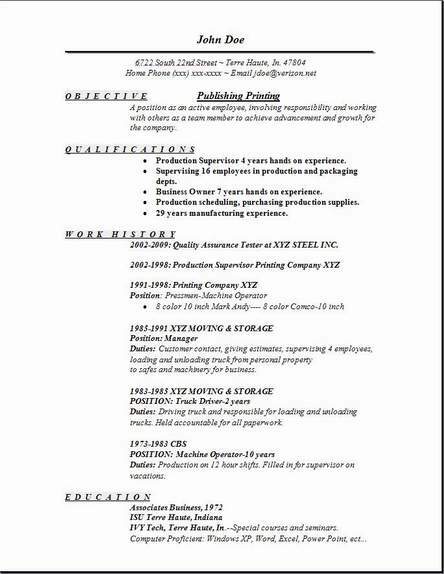 Industrial production manager, will oversee the entire production for the publication. Magazines, also many newspapers, plus directories, employ many individual sales agents in advertising. They take on planning the press releases and advertising. Distribution covers all invoicing, completing all the order processing, warehousing and also shipping. The creation of an iron clad contract for the publisher to use to secure a release from the author. If you have skills in the accounting field and the financial management field, then your career can possibly lead to a top executive position in almost all publishing companies. Printing Machine Operator positions, Transportation jobs, Sales positions, Laborers and shipping freight, stock, Packers and offbearer positions all fall under the production category.